In the past I’ve bought a used layout, in my case it was the layout that became Bawdsey. It’s one of those layouts that captures my imagination, and suits BR steam into 70’s and 80’s blue as the article images show. So if you’re short on time, space, or want to try N Gauge, here is a real opportunity to get that quality kick start with Milton Street. This weekend was a good shakedown for Shelfie2 at the Define show. The Dinghams worked with a high degree of reliability, and generated quite a bit of interest by themselves. The stock worked well too, and we had a visitor in the form of this Oxford Rail/Golden Valley Janus you can see here. Using a layout at an exhibition does fault find for you and there’s one or two pieces of stock that’ll need a bit of TLC to raise it to the reliability I want to give the best show for punters and operators alike. The Janus worked well but unfortunately was one of the wired in reverse releases, which was frustrating and caught me out a couple of times. It has however raised its head sufficiently that I’ll consider one for stock in due course. The example seen here has been resprayed and weathered which has changed its appearance significantly for the better. Layout lighting worked well and over the course of the day gave no problems, this being the first time I’ve used this type of LED strip lighting at an exhibition. The picture you see above is under that natural colour balance the light tubes emit, and they were cool to touch at the end of the day after about eight hours illumination. The backscene material didn’t make it in time, so the backdrop was rigged up from lining wall paper. This allowed me to demonstrate the desired final effect with a piece of pre painted art card. I also received two show invites for this year which provisionally have been accepted, and I’ll post more detail on those in the future. So pretty pleased with the weekend, and the two exhibitions certainly focus the mind for final detail and fine tuning over the next couple of months. To come, more track detailing, more woodland, and a bit more variation in the wagon fleet, and a chassis strip down for one of the 08’s. Enough to keep me out of, or more likely, in trouble, for a while..
Well I’m definitely getting there, not just with the layout but to Define 2019 this weekend. Define will be a first showing for the layout, it’s a one day event, sort of a social/open house thing by the Define group. 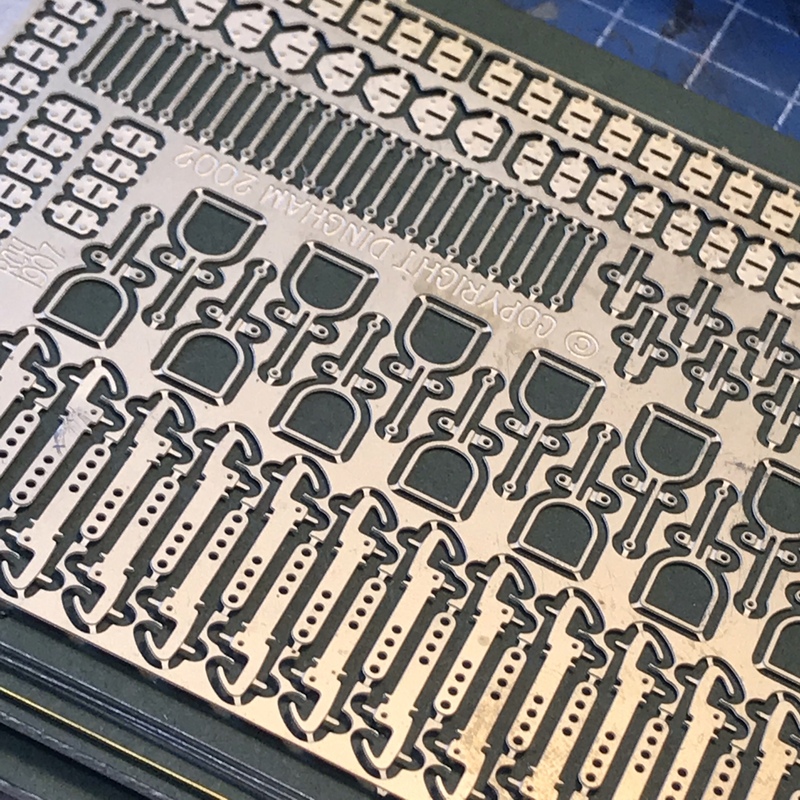 I had hoped to have the backscene and fascia’s completed, but the material is still in Germany after a Spinal Tap and measurements type re-occurrence! So this weekend I’ll rig us something that’ll give very much the feel of the finished design, but Blue Peter styley it’ll involve an adult, sellotape, sticky back plastic and a metal coat hanger. 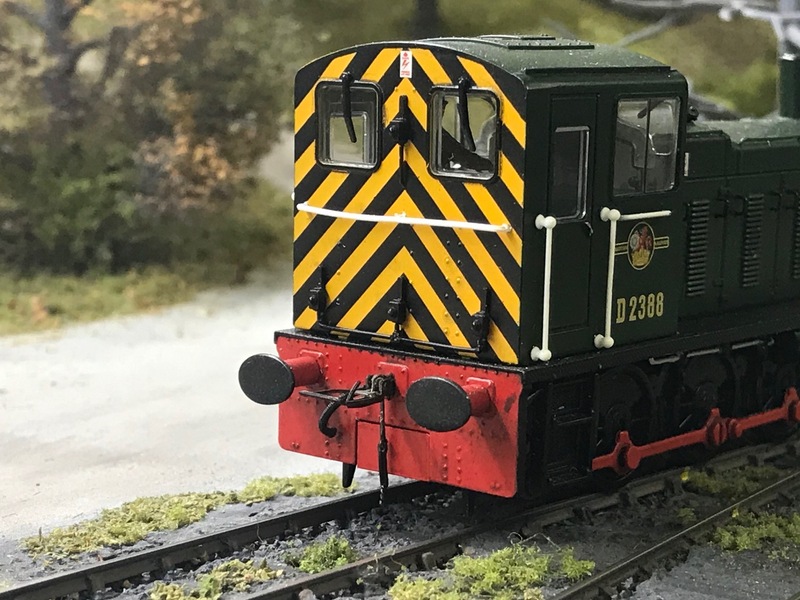 The largest loco in use will be this Class 25 with a re worked chassis, fitted with Dinghams too, it’ll get a good test under show conditions. The layout is old school DC, points are all electrical fired by Tortoise motors, and the Dinghams by Gaugemaster electromagnets. The stock requirements are pretty low on this one, hoppers, and a few brake vans, all getting final checks today. I’ll likely bring a handful of 16t’ers and another 08 in the event of coupling failures. The woodland areas are nearly complete too, but you’ll be able to see the make up of them and how they’ll build to make a dense backdrop giving the impression of a small drift mine disposal point, on the edge of woodland. There’s the possibility this layout will drop into my Forest of Dean, Severn & Dean project in the future, hence the woodland. For now however, its rural Northumberland at Guyzance, in the shadow of the northern Cheviots. It’s worth the effort, do come along! Just a quick note to wish readers a happy new year and to say thanks for taking time out of your life, to read the blog. It means a lot that you visit, it really does, and it’s a pleasant surprise to realise this is the seventh consecutive year of an increase in hits, and readers, from across the globe. The heading image is Shelfie2 and it didn’t seem right not to have a Pannier shot on this post, so gratuitously here it is! The layout will be out this year doing a few shows, and I hope a couple of magazine appearances. If you have time, please take a look at the other bloggers works on the blog roll, they’re a regular source of inspiration and ideas with superb writing and illustration. And again, thank you, I wish you well for the forthcoming year. Many years back I settled on three link couplings for my rolling stock on the OO and EM layouts I’ve either made or been involved with. Their visual benefits are easy to see, but they do have a few practical drawbacks. On short stock they’ve worked well, however as stock length increases the potential for buffer lock increases too, even allowing for sprung buffers. Throw in a reverse curve and the chance of buffer lock increases again, and all the while these couplings require large radius curves, meaning that layout design has to take these couplings into account from the outset. There are some similarities with Dinghams in this respect, ideally the layout design should take into account the couplings, and there are one or two catches in their set up and operation. So this is how the Dingham couplings are supplied, as a flat etch with soft iron wire for the electromagnet dropper. I’m using them on Shelfie2 the track is Peco Code 75 flatbottom rail as well as the new bullhead track too. Baseboard material is 9mm MDF and Woodland Scenics foam underlay between track and baseboard. 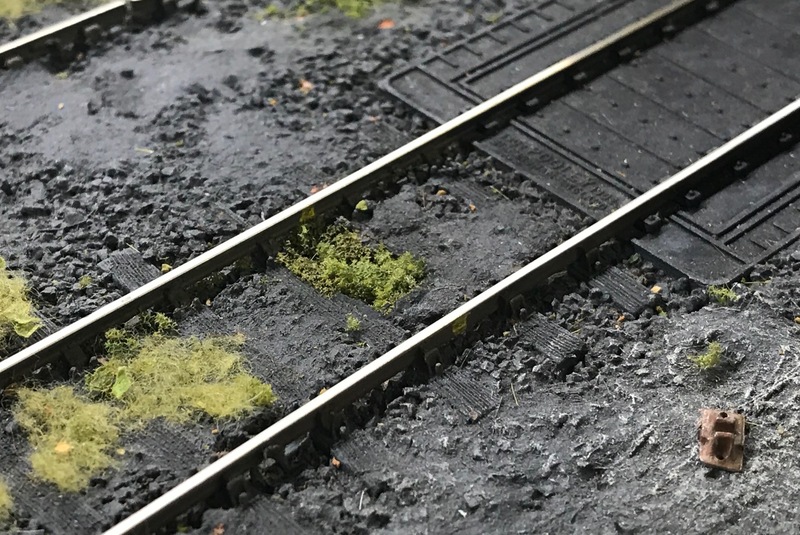 Track is painted with acrylics and the ballast is a mix of DAS modelling clay, and Woodland Scenics ballasts. I’d written I was experimenting with these couplings in an earlier post, and Mark Davy responded in the comments section. His comments on his experience matched mine and clearly he and Brian Lewis has overcome some of the issues I’d yet to find. Mark has kindly allowed me to use his comments which form the core of this post, the images are mine from those I’ve assembled, and I’ll add a few elements of my experience too. So without further ado, over to Mark whose comments and notes are in bold italics. I’m interested to see that you are trying 4mm Dingham couplings for Shelfie2. Brian Lewis and I have spent the last couple of years fitting them to the stock for his ‘Tetbury’ layout (P4). Since my fingers are a little younger than Brian’s, I’ve done most of the assembly and fitting. Over 100 vehicles later, I’ve learnt a lot of lessons; (and some interesting language !) You may find the following notes useful. When soldering the pivot wire into the hook, I find the suggested wooden jig very useful. 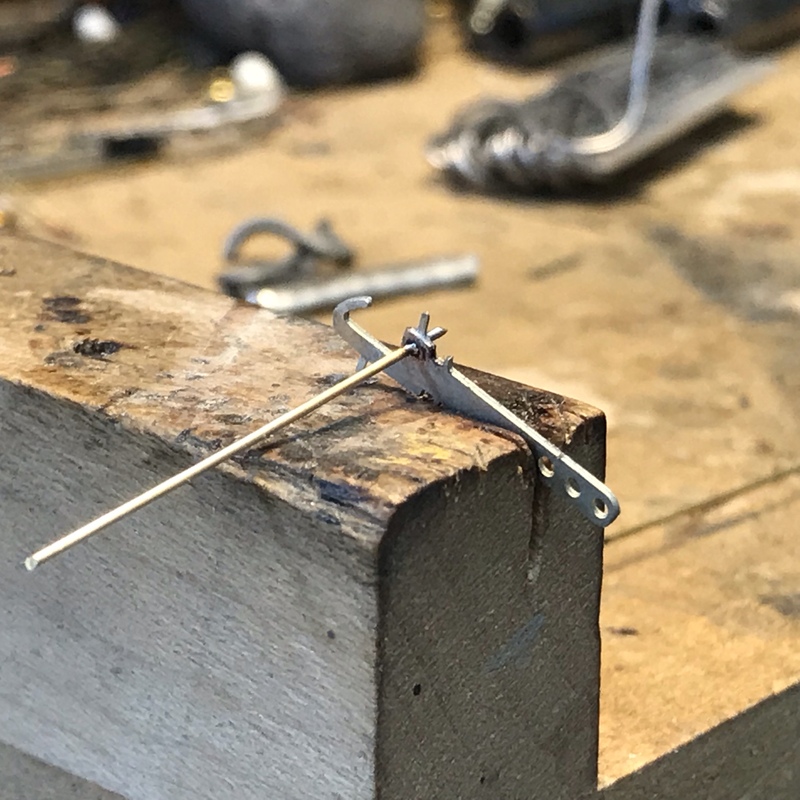 Tin the wire first (sparingly), push it through the hook into the jig, add flux and solder. Easier said than done as you don’t want too much or too little solder, and the pivot wire must be square to the hook. It usually takes me several attempts to get it right. Pivot points completed, batch assembly makes sense! Pairings of loops and latches. The dropper tail can be adjusted to suit different chassis’. When bending the tail of the loop downwards, it is essential that the bend is as close as possible to the pivot lugs, especially for 6mm buffer-length (unfitted) vehicles. I tend to make this bend (over the stock of an engineers square) before bending the pivot lugs upwards. We also use the type 2 latch. Type 1 Latches. The tail folds to roughly 70 degrees. Type 2 latches are U shaped. Loops and latches ready for chemical blackening. When finished, the latch and loop must move up and down freely. Once raised they are often reluctant to drop. Possible problems here are too much solder, the sides pinching the hook near the pivot or the tail rubbing on the hook. I used a slightly different assembly method to Mark, I didn’t tin the pivot wire, I just tack soldered at the join to the hook, and then cleaned the joint afterwards. The dropper tail should ideally bend under the buffer beam, however with the 03 Diesel shunter that wasn’t an option, so I have a vertical drop parallel to the buffer beam face. For the wire dropper I’ve used a thicker florists wire this can be glued rigid and doesn’t then get caught in any chassis detailing. Dinghams don’t work very well with sprung buffers – when propelling, the buffers compress and the coupling loop catches under the latch on the adjacent vehicle and so doesn’t uncouple. We now fix the buffers with a little Evo-Stik contact adhesive behind the headstocks/buffer beam. This can be removed fairly easily if required. Buffers that project less than 6mm will need to be replaced with longer versions. The instructions say that the end of the coupling hooks should be in line with the buffer faces. We’ve found that for reliable uncoupling the hook should be about 0.5mm behind the buffer faces. Otherwise when propelling the coupling loop catches under the latch on the adjacent vehicle and so doesn’t uncouple. 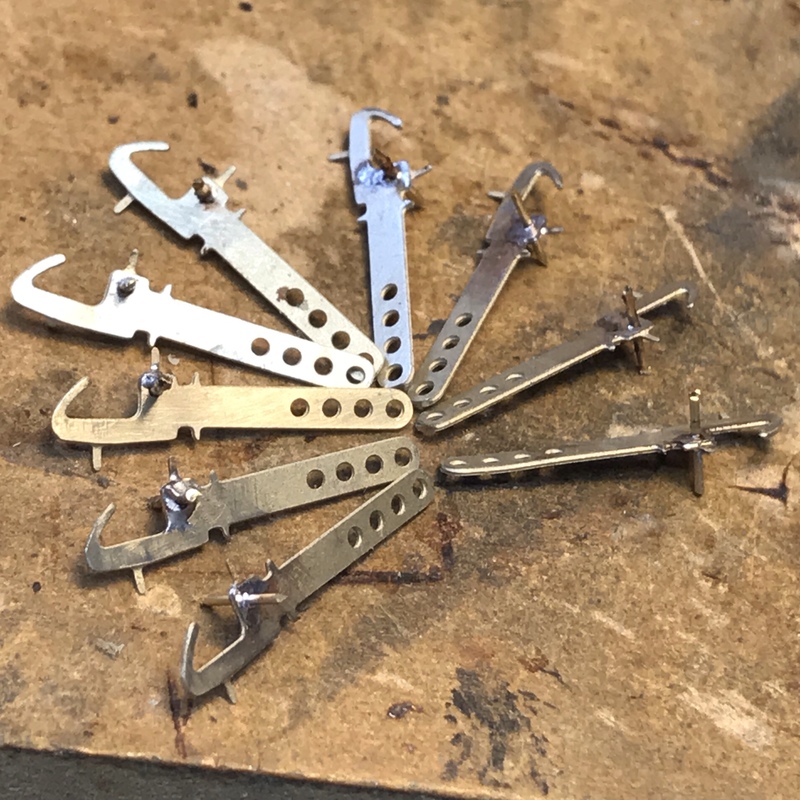 The instruction regarding the height of the hook at the headstock is good, but the coupling often droops while being glued into place, and it is the height of the front of the hook that is critical. I use a jig to support the end of the hook to hold it at the correct height while the glue sets. The critical dimension is 12.5mm from railhead to the bottom of the hook. Consistency is essential ! When first fitted the front of the loop often slopes from side to side, or is not quite at the correct height. Gentle tweaking should correct this. I don’t recommend superglue when fitting the couplings – it tend to run around and glue the whole thing solid ! I use Evo-Stik contact adhesive, which can be removed fairly easily, but it takes some time to set and I’m sure it moves as it does. Five minute epoxy might be better. You may find that vacuum and steam pipes sometimes prevent the loop from rising fully. Either bend the pipes to one side, or remove them ! Once the couplings are fitted, the magnetic dropper should be trimmed to just above rail head level – a full 1mm is not necessary. When weathering rolling stock, keep the paint away from the couplings ! Mark and Brian’s experience matches mine almost perfectly. I’ve also found that free running stock can also give reliability problems. 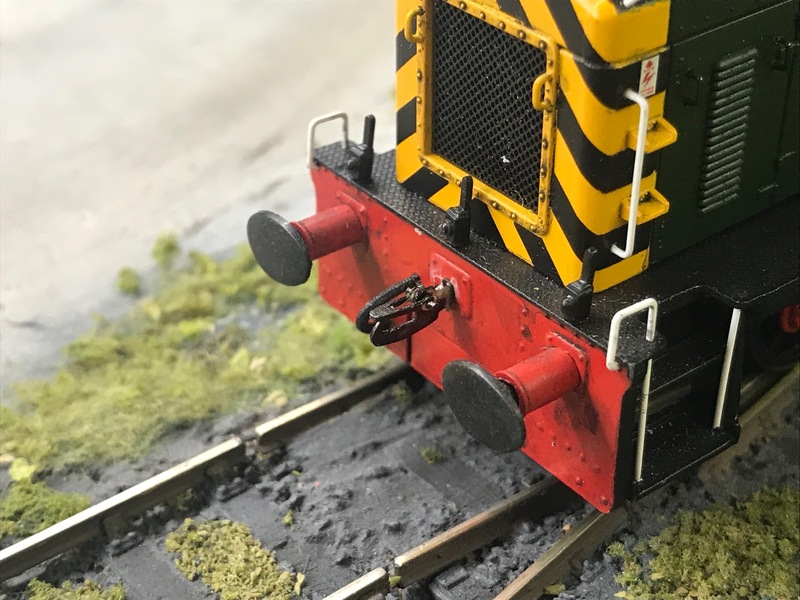 The sprung buffers and free running can allow stock to ‘bounce’ backwards and forwards, this can sometimes bounce past the hook and latch, so an uncoupled vehicle can re-couple again. Hornby 20T brake van with axle brake fitted, note brass wire bearing on the axle shaft. To minimise this I put a brake on the axle of any particularly free running wagon. 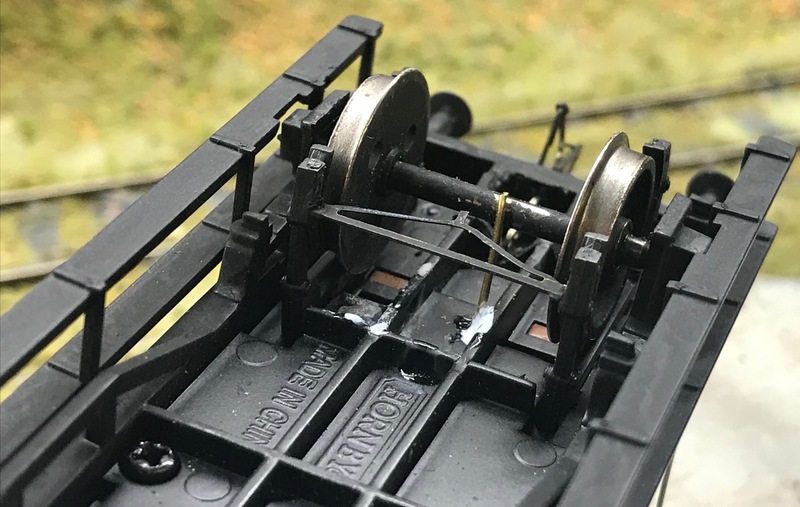 It’s nothing more than a piece of 0.5mm wire bearing on the wagon axle, this provides sufficient retardation for the wagons so they rarely leave a big enough gap for the loop to re-engage the opposing hook. This was a bit of a culture shock having previously ensured that all stock was running as freely as possible! For the fixing I have used low viscosity super glue, this gives a very quick and reliable fixing, which to date hasn’t caused any issues. Initially we tried fixed permanent magnets with variable results, the main problem being trains parting unintentionally as they passed over the magnet. We now use Gaugemaster (SEEP) EM1 electromagnets. These work very well on 24 volts DC. 12 volts didn’t have enough pull and AC makes the magnetic droppers jerk around, sometimes getting caught up under the vehicle. When fitted, the top of the electromagnet pole piece should be level with or just above the sleeper tops, but not lower. 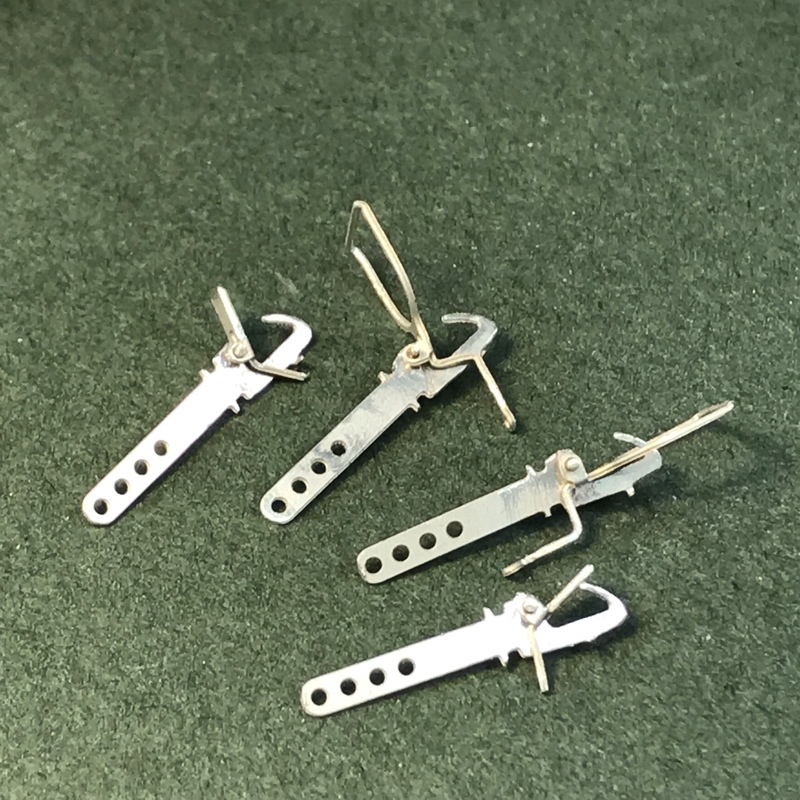 The 4mm Dinghams are fiddly to make, but once correctly fitted are an ideal auto coupler for layouts where the stock does not need to be turned. The delayed uncoupling feature is invaluable. 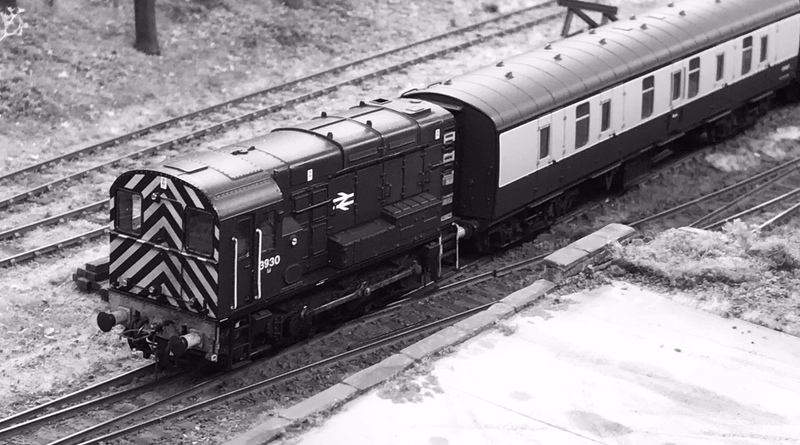 Brian used the 7mm versions on his O gauge ‘Llaniog’ layout. Both on this and his previous ‘Chagford’ layout (P4), he experimented with other auto couplers – Sprat and Winkle, DG, Winterley and AJs. All had their good and bad points. Some were obtrusive, some required an unprototypical shuffle in order to uncouple. Others did not take kindly to being transported or being subject to rough shunts and so needed constant tweaking. Opinions are subjective, but on balance he feels that Dingham couplings score highest in terms of all round reliability. Our couplings are not 100% reliable yet – but we’re getting there! Magnet location hidden beneath darker green foliage. Like Mark and Brian I’m very pleased with the Dinghams. They do take a bit of effort in their manufacture and fitting. I’ve been very fortunate with Richard Chapman sending me some ready built couplings which worked superbly and helped me get my head around the construction and fitting of them. I’ve used a 15V DC source for my electromagnets, a Scalextric power supply which gives a smooth and efficient operation with a high 90% reliability. I’ve been using switchgear made from press to make, non latching switches which have not been reliable, the contacts have needed cleaning on a few of them. The next step is to build a dedicated switch box with better quality switches from RS components. Once I’d become accustomed to using three link couplings over many years, I didn’t think I’d be so taken by these couplings. All coupling systems have their advantages and disadvantages, these appeal as they are completely hands free and once blackened very discreet in their appearance. 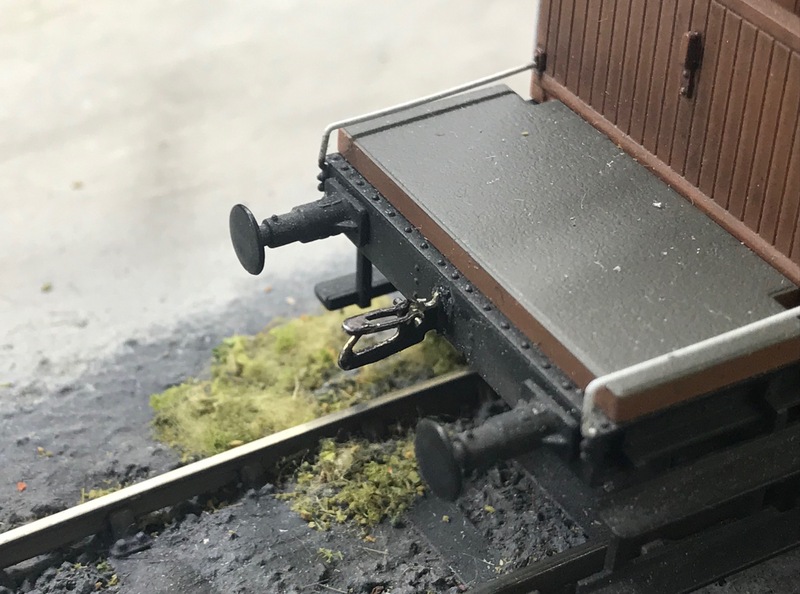 One disadvantage is they are ‘handed’ so all stock has to be run facing the same way, so the original idea for a turntable fiddle yard isn’t practical. 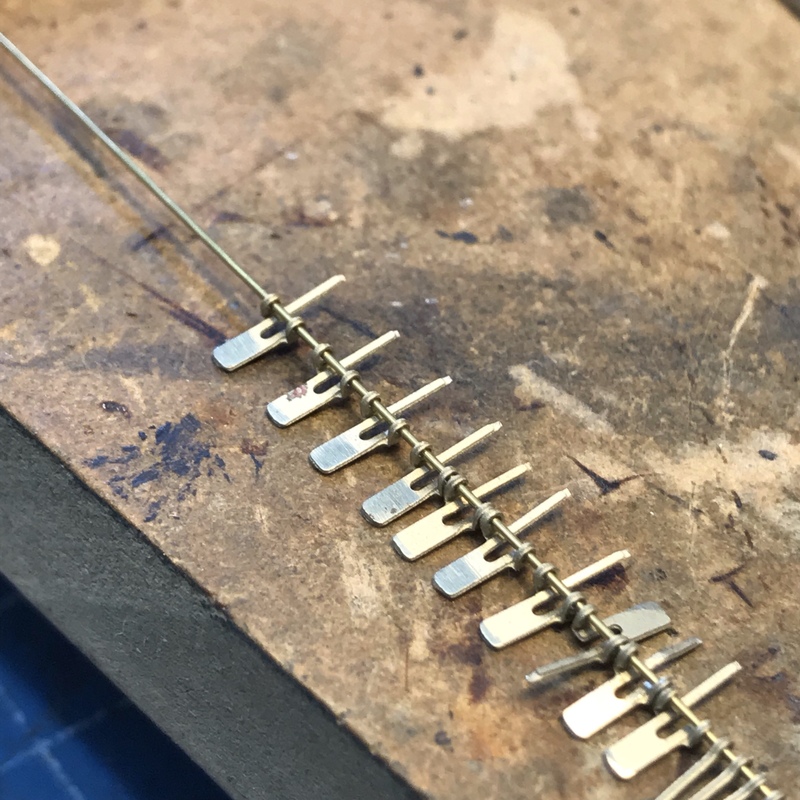 I’m not sure I’ll use them across other projects at the moment, the uncoupling does require straight or almost straight track, and coupling up on tighter curves occasionally means the loop misses the hook, sliding alongside the latch hook. Locomotive control has to be excellent to allow the couplings to operate reliably, I chose the Bachmann 08, 03, 25, and 57xx pannier for my test fleet, knowing they would have the slow speed consistency required. The real appeal of Dinghams for me is that Shelfie2 is now completely hands free operation. With hand controllers for points and couplings, the operator can walk around the front of the layout enjoying the different views, or at an exhibition, sit out of the way of the viewers, yet still be able to see and operate the layout in effect remotely. 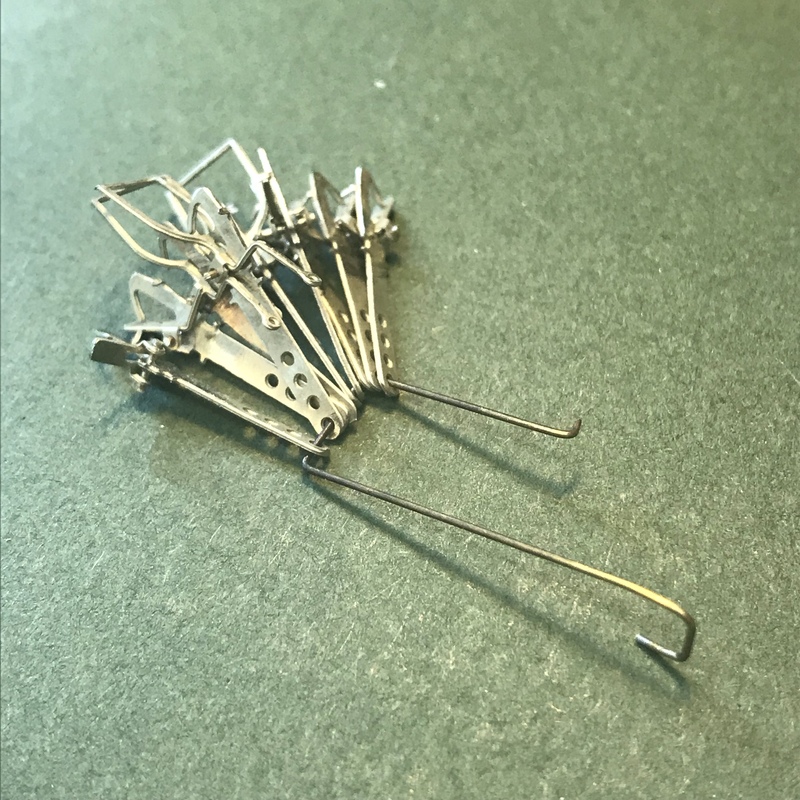 If you’re looking for an uncoupling system that is relatively discreet, can be worked hands free and don’t mind a bit of effort in setting up the system, for 4mm scale Dingham are well worth investigating.